It’s not as hard as you may think and I will suggest a few programs for you to check out and think about what might work for you. The two most profitable and popular niche markets are the EVERGREEN or SUSTAINABLE and the PASSIONS or HOBBIES niches. You may already know about Amazon, but let me show you other various affiliate programs should you want to take on the niches of PASSIONS AND HOBBIES. The Passions and Hobbies niche is profitable because most people will spend their money on products that are associated with these markets. Who hasn’t personally spent a couple of hundred dollars when they go to watch their favourite baseball team or when they attend a concert of a favourite musician? People who are passionate about a product or experience will spend plenty of money to satisfy their passions. Let us say you are passionate about your hobby of Coin Collecting. Most likely you will have no problems paying a lot of money to own the latest item. You don’t need to look to far at how people crazily spend up on a passion for tech items like Video Game Consoles. Have you noticed that every time a new Sony PlayStation or Microsoft X box model is released people will stand in long cues at the stores just to buy a new one. Many will even pay triple the price just to get one prior to Christmas. These peoples’ enjoyment factor will always spend a lot of money on niches they really want to partake in. It is like satisfying their craving need for something they want to have at once. When a person extremely enjoys something and wants to be among the first to own an associated product, they will gladly spend lots of money. Following below I will list out some really good affiliate marketing programs in many, not all, of these profitable Passions and Hobbies niche markets. If you haven’t joined Amazon as well, I do suggest that you use Amazon as one of your affiliate programs, and also broaden your horizon and join other programs that pay higher commissions. Many people love being in the Collectables Hobby. There are many Collectables niches, but first let me explain something. Many niche markets overlap. Collectables, on its own is too broad a niche because there are collectable’s in many sub niche markets. Even items like TV Geek items can be considered collectable’s. 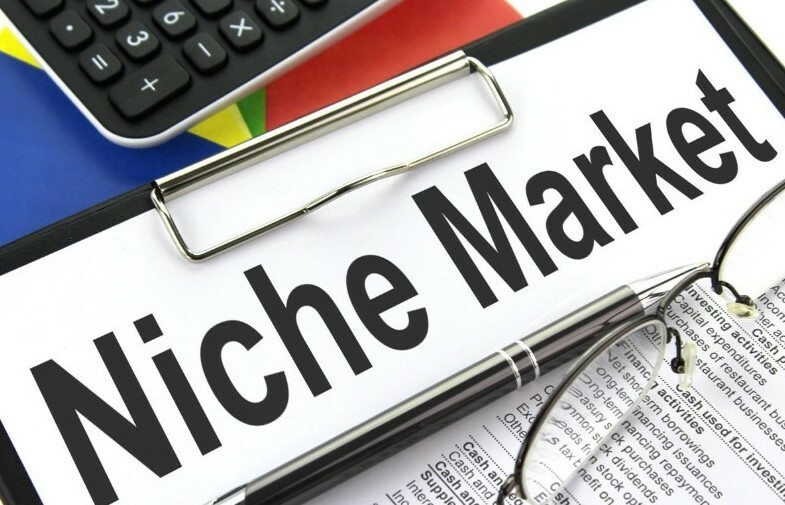 Narrowing down your niche is an important part of affiliate marketing. Just to say you are in the collectable’s niche, you would have to be more specific and zero in on targeting on a specific product item. Example, you could be in the coin collecting niche, the Precious Moments Figurine collecting niche, baseball card collecting niche, plus many more, I think you get the idea. Very popular collectable’s market can most times be associated with well-known companies that advertise their products and items country and/or worldwide. They have great exposure that many people are aware of and give off appeal to budding fans and enthusiasts. Below are two such extremely sought after collectable markets all around the world. We all know of Coca-Cola and it is a company that has been around for than 100 years old. Its soft drinks and products are advertised and sold all over the world. You may have watched reality TV shows like American Pickers, Pawn Stars or Storage Wars, and whenever Coca-Cola items were found or sold, they would always command a hefty price tag. Click the link above to check out where you can sign up and for the affiliate program information page as seen in the above image. CocaCola Store sells all kinds of Coca-Cola collectable’s. Coin Collecting is a niche that many people have thought about starting when they were young kids. You might not realise but it is quite a popular hobby for many adults. You may personally know of some friends that have a collection already. Coin collecting is done by people in many countries giving the niche a worldwide reach of being able to earn a passive income. 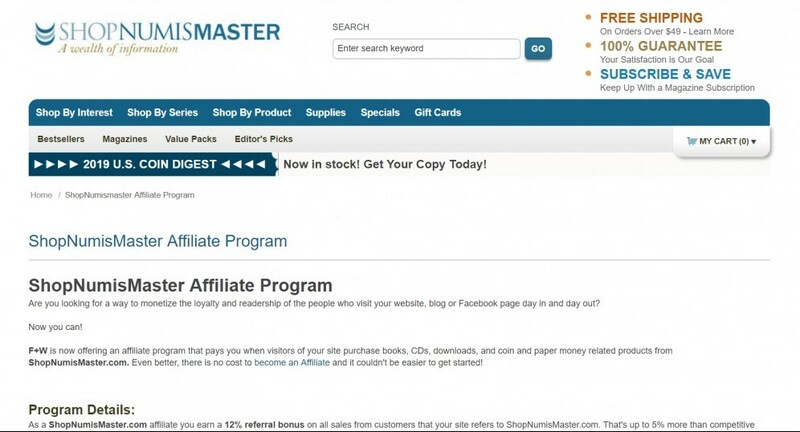 The above link is to the affiliate program information page as seen in the above image, of the website called ShopNumisMaster, which sells books, cases, and supplies for coin collectors. 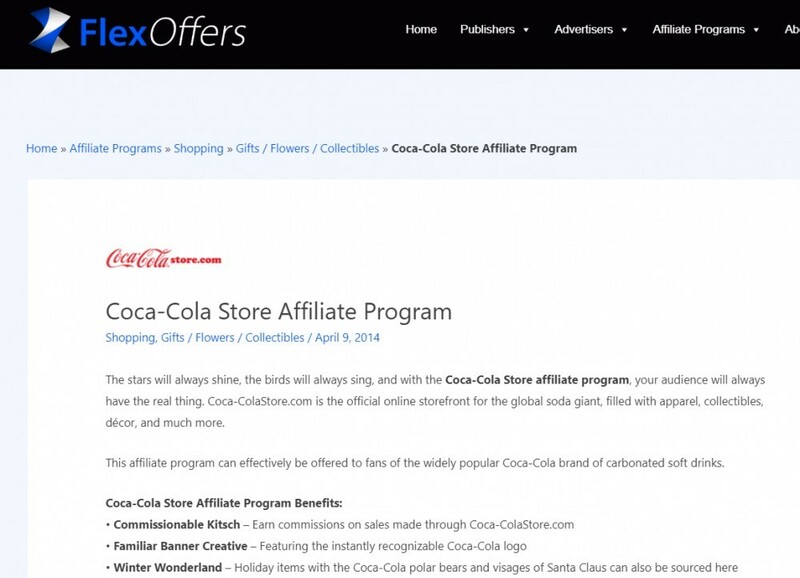 This affiliate program offers a 12% commission. The Sporting niche market is hugely broad, popular and profitable. The availability is also worldwide and there are many kinds of sports you can target in your affiliate website. It could be Soccer, Hockey, Golf, Basketball, Lacrosse, Football, Rugby, Tennis, and many more including the two below. You already know how popular the sport of baseball is. Being played in many countries around the world these days you can imagine the fan fare. When choosing baseball as your niche you will need to narrow it down to specific related products or even focus in on promoting a specific team, stadium, player or position. The link above is to the affiliate program information page as seen in the above image, of the website called MLB Shop, which sells every kind of baseball related equipment and team related clothing for fans. This affiliate program offers up to a 6% commission. NASCAR Auto Racing is one of those overlapping niches I mentioned earlier. NASCAR auto racing is already America’s number one spectator sport and can be classed under the Sports niche, although it is the model cars themselves that are highly collectible and sort after than items of the drivers and the sport as a whole. The link above is to the affiliate program information page as seen in the above image, of the website called NASCAR Shop, which sells all kinds of related items and clothing to fans and collectors of NASCAR. This affiliate program offers up to a 6% commission. There are many people that follow various religions. Even if you do not follow a religion or a spiritual tendency, the Christian niche is a popular industry. Regardless of your religion or spiritual affiliation, there are programs that are available with affiliate marketing opportunities. Following are two programs that can be used for an online business while helping out many Christian followers. You can also find similar websites relating to religious niche just by doing a simple search on google. It does not matter what you follow, there are specific dating sites that cater to all facets of individuals needs. Religion is no different and you can even affiliate political parties if you so chose. Dating sites that help to match people of like-mind with one another is a very popular and profitable niche in the Passion and Romance markets. The following has the highest commission. 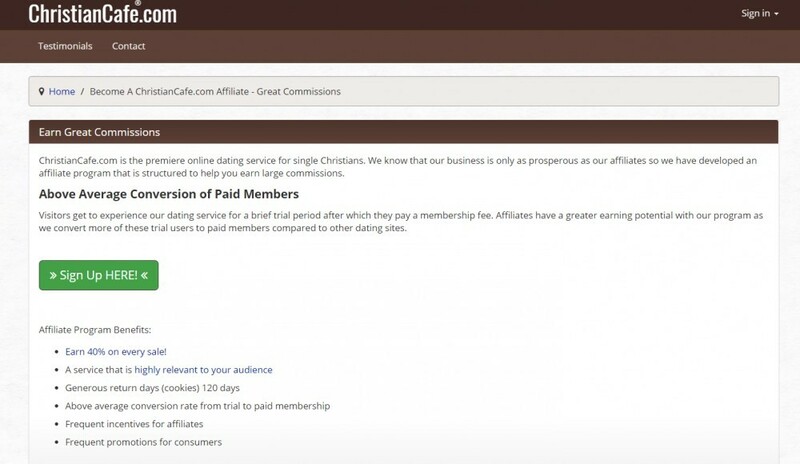 The link above is to the affiliate program information page as seen in the above image, of the website called Christian Café, which sells different membership packages. This affiliate program offers up to a 40% commission. 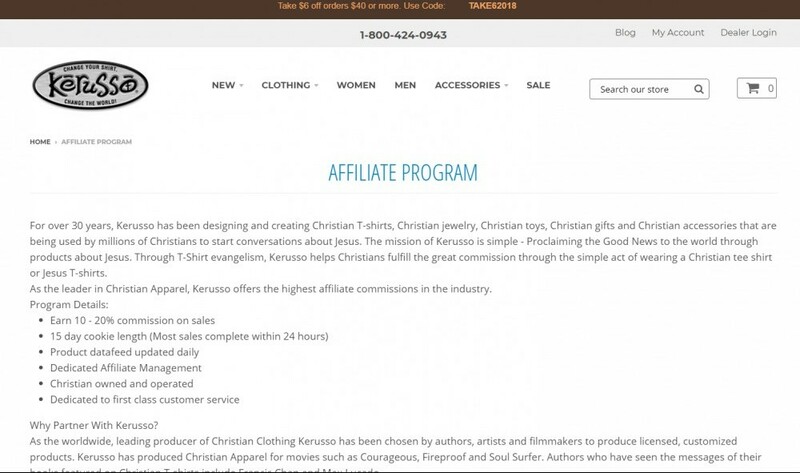 The Kerusso website is very popular among st the Christian community. Don’t think that they only sell Bibles and prayer time items, they sell many items you might not have thought of associated with the relationship with God. You can see in the image below they have clothing and other accessories available through their website. Another very broad niche market with many areas you can follow. The fan base associated within this nice is potentially huge and though I could have chosen from so many options in this category, I have picked those that are the most known around the world and that you would know of yourself. Too often people don’t drill down enough when searching for a niche to promote and will overlook something like a fan-favorite TV and movie series. Always remember what a niche is. A group of the population that has a desire or need for associated products of the niche they have a passion and want for. Surely you can understand that Star Trek has a HUGE worldwide fan-base but did you know that you can become an affiliate for their products and items. 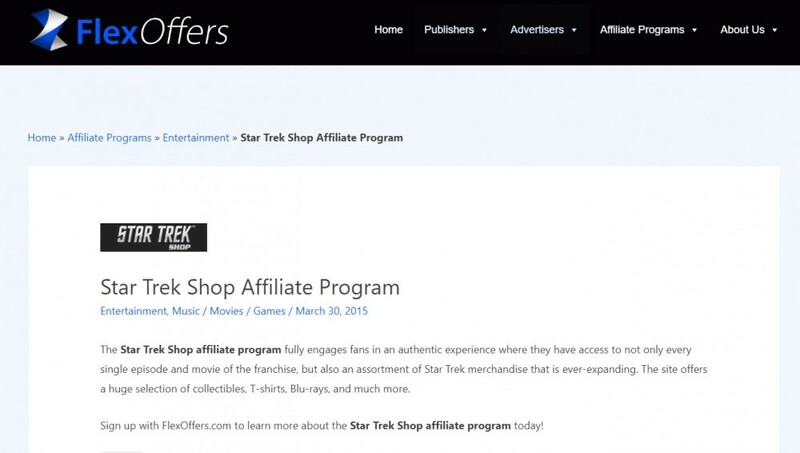 The link above is to the affiliate program information page as seen in the above image, of the website called Star Trek Shop, which sell every kind of collectible, clothing and accessory items. This affiliate program offers a 5% commission. Just like with the Star Trek niche above, there are plenty of other movies and television shows that have a ton of followers. Each one of these are individual sub niches. You could do a website solely on one TV show or movie, or you could combine a couple, such as your favorite selection in superheroes. Making money with these affiliate programs you need to remember to drill down to a specific sub niche. One way to help you do this is to visit the main home page for each of these websites and look at what they are selling. You can find many niche ideas that are endless. You can also workout and notice how some niches within the websites can be joined with others. Let us take the ThinkGeek website. If you chose to make your affiliate niche website about Superheroes, you could drill down and promote items for not just Male Superheros but also Female Superheros and concentrate with Wonder Woman and all the other female superheroes as well. Maybe some of the superheros from Xmen, Batgirl, Supergirl, the Invisible Woman, and Catwoman. I think you get my point. Just by looking and studying each website you can drill down to many possible tight drilled down niches and gain a foothold in the market place. The Passion and Hobby niche market is quite profitable because there are millions of people who are fans and engage in these niches all the time all over the world. You can make a lot of money by just narrowing down to a specific sub niche, like the Female Superheroes niche idea above. So these affiliate programs I have revealed are in niche markets that have a huge following, and the potential for making a handy passive income is very do-able. All you need to do is look at these websites and decide on what your drilled down niche might be. I can go to the websites of each affiliate program I have posted and find at least one niche market to target. What about you? Can you find a profitable, and all niches can be profitable, niche market from any of these programs? If you would like to learn more about becoming a Profitable Niche Affiliate Marketer and become part of a community of like-minded people, then join me by clicking the banner below. Make a start and change you life.